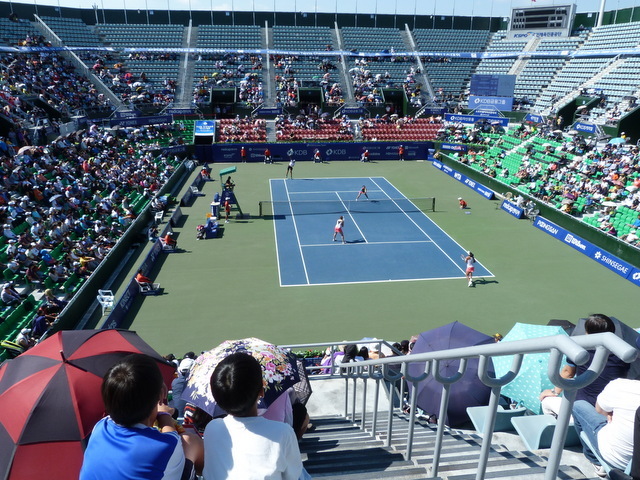 WTA Korea Open, Sunday 23rd September 2012, Noon. Whilst I’ve seen plenty of tennis matches on the telly I’d never watched one in real-life, not a proper one anyway. I’ve watched mates play whilst I’ve waited my turn, sometimes on a normal court and before that, as kids, in the road where a net wasn’t seen as necessary and the differing colours of tarmac marked out the boundaries of the court. As good as those games in which we pretended to be Connors against Nastase were, I’d always had a suspicion that the proper matches might have been of a slightly higher standard. 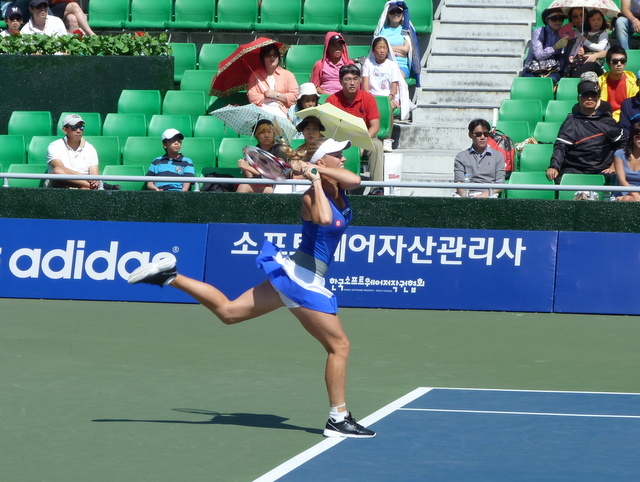 So, when I noticed that there was a WTA tournament taking place in Seoul I was keen to go along and have a look, particularly when I discovered that the final coincided with a Sunday where I had nothing planned. The tournament was taking place at the Olympic Park Tennis Centre which, as you might have guessed, was built for the 1988 Olympics. Tennis returned to the Olympics at Seoul and I remember that there was a fair bit of controversy over its inclusion. Some Czech fella whose name I didn’t recognise won the Mens Singles whilst in the Womens event Steffi Graff beat Gabriella Sabatini to take the gold in a year where she also won all four Grand Slam Championships. Gabriella Sabatini – do you remember her? 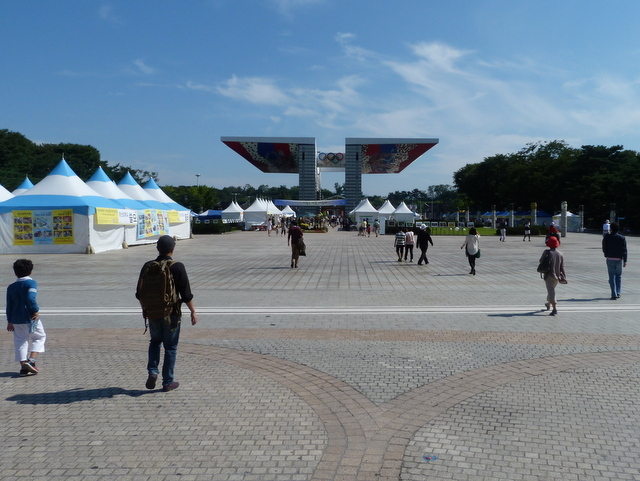 It’s easy enough to get to the Olympic Park from Yeoksam and I’ve walked it in around an hour and a half before. However, a combination of a late start and the hot weather meant that I took the subway to Mongchontoseong instead. The World Peace Gate entrance to the Olympic Park is just outside the subway and it’s then about a twenty-minute walk through the park to the Tennis Centre. 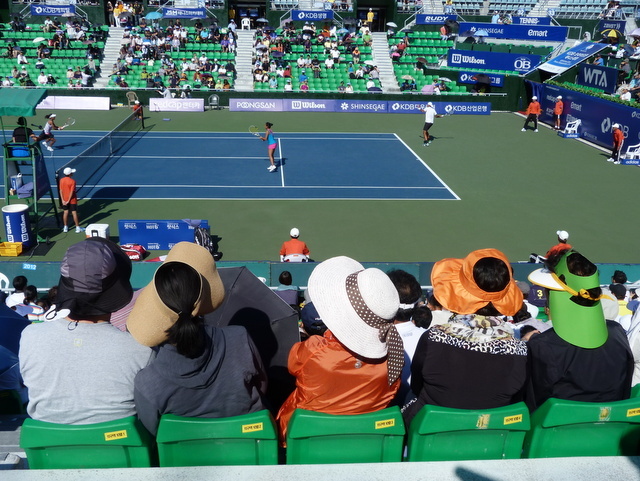 I hadn’t bothered trying to buy a ticket in advance, partly out of laziness but mostly because the main stadium at the tennis centre seats ten thousand people and I couldn’t imagine there being that much local interest in a tennis match that didn’t feature a Korean player. I’d been right with my assumption and I had a choice between a unreserved ticket at 20,000 won or a reserved seat at 30,000. I took the more expensive option and after selecting a block along the side of the court, found myself five rows from the front. There was still half an hour to go until the start and at that point I’d reckon there were probably around five hundred people inside the stadium. At noon the players came out to warm-up. 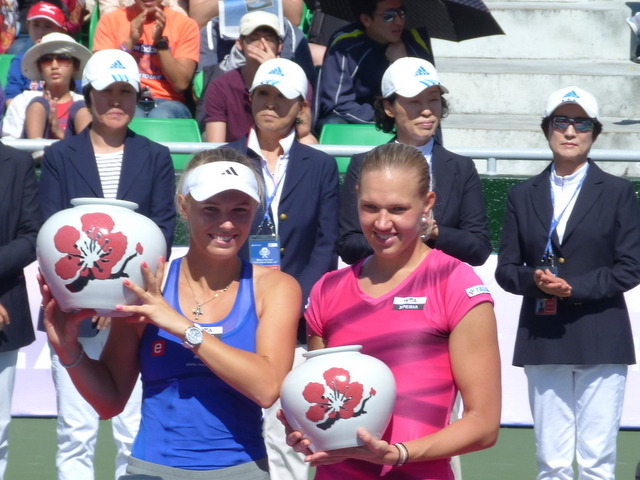 The top seed Caroline Wozniaki was taking on Kaia Kanepi. I’d never heard of Kanepi before but I’m pretty sure that Wozniaki had been ranked number one in the world not so long ago. As the first game got underway the crowd was still below a thousand, although over the course of the match it probably doubled. This caused a few problems as so many fans were coming in at each change of ends that the re-start was invariably delayed. The problem was compounded by people nipping out for a drink or a hot dog and by the general lack of understanding of how to behave when watching tennis. I could sense the exasperation of the umpire when her success in reducing the yapping to a tolerable level merely served to make the frequent ringing of mobiles more audible. One women had even brought a crying baby in with her to liven things up. An hour or so after the start, people were still arriving. In fact the couple in the seats next to me didn’t turn up until after the match had finished. They had missed an easy win for Miss Wozniaki, 6-1, 6-0 for those who like a bit of detail. The presentation afterwards took almost as long as the match with lengthy introductions for those presenting trophies and flowers followed by speeches from sponsors that were then translated into English. Each player went home with a big cheque and an even bigger plant pot. Ideal for keeping the car keys in. 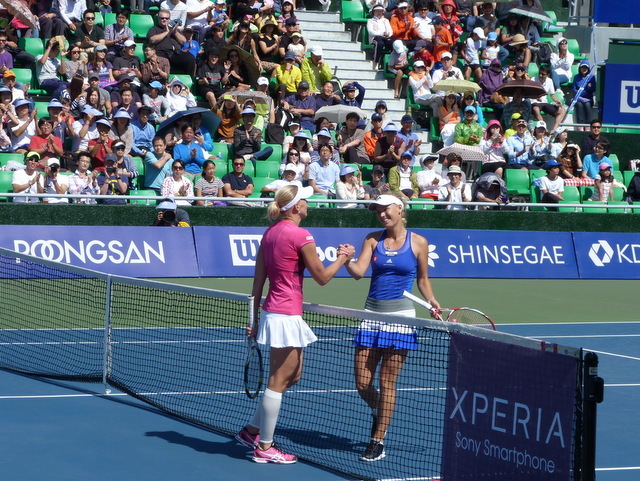 Fortunately for those who had just arrived there was a second match to watch, the Womens Doubles Final. Americans Raquel Kops-Jones and Abigail Spears were taking on fellow American (do you say ’fellow’ when you are discussing women?) Vania King and her Uzbeki partner Akgul Amanmuradova. Now, I don’t want to be unkind here, but my first thought was that the 6’3“ Miss Amanmuradova was actually a bloke. Really. The combination of her height and her choice of mens clothing meant that when they were warming up I’d assumed she was a male coach. As the starting time drew nearer and it looked more and more likely that she was playing, I genuinely wondered if the real player had been injured and that an exhibition game between the women finalists and a mixed-doubles pair had been scheduled as a replacement. Sorry Akgul. As you would expect, Miss Amanmuradova had a powerful serve and her pairing took the first set. I’d moved seats between the matches to see what the view was like from behind the service line. For what it’s worth I think it’s better. It’s more like the view you get on the telly and you don’t have to move your head from side to side to follow the play. The downside of my moving seats though was that I was a lot more exposed to the sun than I had been and as my knees started to burn I decided to call it a day midway through the second set, sneaking out as discreetly as I could between games. I had a look for the result later and the match had gone to three sets with Kop-Jones and Spears overturning that first set deficit to take the title.